What makes a truly great fantasy/paranormal novel? Numerous things of course, but I filter it down to two key qualities. First, the reader becomes so invested in the characters that she lives and dies by their successes and failures. Secondly - and most importantly - by the end of the book, the reader has forgotten that the fantasy world is not real. 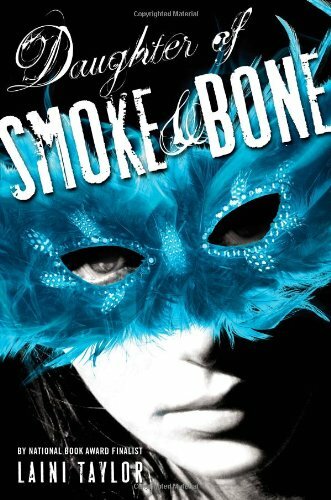 Daughter of Smoke and Bone definitely fulfills both of these qualities. You become totally immersed in a very foreign world that seems entirely believable and follow Akiva and Karou's every move with anticipation, excitement, and terror. What makes this book so wonderful can be broken down into a few more subcategories. First, our leading lady Karou and leading man Akiva. Karou is everything you want in a teenage protagonist. Smart, artistically talented, brave, funny, independent, not obsessed with boys, and devoted to her friends and family. Akiva is haunted and angry, yet also resourceful, loyal, romantic, and fundamentally good. Their romance is a key part of the story, but Karou in particular exists without Akiva. While their relationship was a bit insta-love, the intensity fit the situation. The reader gets to know Akiva before Karou does. This sets a mysterious tone, but also downplays the speed of their romance. And what a romance it is. Laini Taylor has a knack for writing scenes between Akiva and Karou that make your heart race and keep you turning back the pages to re-read the romance. Family and friends are a key part of Daughter of Smoke and Bone. I loved Karou's best friend Zuzanna. Their banter was hilarious and showcased how Karou both could and could not have a normal life. Most important was Karou's family, the chimaera who raised her: Brimstone, her "father," Issa, Yasri, Twiga, and Kishmish. Karou spends much of her life running errands for Brimstone - collection teeth. While Issa fusses over her, Brimstone is reserved with his praise and affection, but you know it's there. Brimstone is a character we slowly learn more about and come to truly admire and respect. In fact, one of the key differences I see between Akiva and Karou is how Karou's confidence and vivaciousness implicitly shows a girl who is well-loved. Even though Karou's family are absent for large portions of the book, their presence is always felt. It's wonderful to have a strong family plotline is a YA novel - a unique one but strong nonetheless. Laini Taylor's writing is simply marvelous. Despite having rich, detailed descriptions, the book flows smoothly. The action, character development, and romance are spread evenly throughout the book so it never drags. I particularly loved how the world was slowly revealed to the reader. There's a fine balance between mystery and confusion. I hate books that keep me in the dark for three fourths of the story, but I didn't feel that way with this book. I was puzzled but intrigued. And I loved how the things that seemed inconsequential or confusing when I first read it made complete sense when I revisited them after I finished the book. A good book is one that is richer on the re-read than on the first go through. The world building was just about perfect. The book is made up of seraphim and nephilim. Traditionally, these creatures are known as angels and devilish creatures. But these are not your harp strumming, robe wearing angels. Neither are the chimaera, despite their animal/human appearance, the thoughtless devils that we associate with legend. No. The seraphim and nephilim are locked in an eternal fight. Both sides have created their own mythology about who began the wars and who is at fault. Both creatures are fully described. Or at least as fully described as is necessary for a first book in a series. There was never an info dump, but I finished the book with a clear idea of the introduced creatures, their legends, and the physical world in which they lived. As for the human world, the setting in Prague was lovely. The ornate Eastern European city added to the book's decadence. I can't recommend Daughter of Smoke and Bone enough. The characters are enchanting, the story rich and emotional, the romance sweet and hot. The book ends leaving you screaming for more. Welcome to the fan club of this book. It rocked right? Great review! This is a great review of the book, but unfortunately I didn't fall in love with the story as much as I hoped I would. I was SO caught up in Karou that when it switched to Madrigals, it through me off. I'm planning on getting this really soon! I'm so excited to read it. Great review. It's making me too impatient to get it. I can't believe I've put this one off for so long---you make it sounds so amazing! I definitely need to get to this one soon. Great review! I agree with you. This is one of the BEST books I've read, not only this year, but ever. Great review. Reading your review makes me want to read it real bad, I've heard great things about this book and can't wait to read it myself! I'm going to be reading this one soon. I've read only positive reviews about this one. "There's a fine balance between mystery and confusion. I loved this book too and such great characters . Brimstone made this book for me. He was mysterious and yet watched over her. Completely agree! I've been trying to come up with a review that matches how awesome this book is but I fail every time. I absolutely loved this book and can't wait to read more. Lovely review, Alison. I love this review so much because it explained so eloquently why I enjoyed the book. It's definitely one of my favourites I've read so far this year. I love this statement especially, "A good book is one that is richer on the re-read than on the first go through" because it's so true! I loved the feel of family in this book too, most of YA books disregard it or it's there simply for the sake of being problematic but you can tell everyone genuinely loved each other. This book made me want to go to Prague so much! Agreed! This book was so amazing. I loved Karou and the writing definitely was fantastic. Awesome review, and so glad you enjoyed it :). "the reader has forgotten that the fantasy world is not real." Fantastic review Alison, absolutely agree with everything you said! I loved how important family, even a dysfunctional one, was in this book! This is a beautiful review. You hit on so many points that I look for in books (worlds that feel real, characters I'll care about, family, the way the romance progresses--those re-readable romance scenes!) Now, finally, I think I'm warming up to the idea of getting over the hype and reading this book. Thank you. I have this on my shelf...I really need to read it because I have heard such great things about it! I'm so glad you enjoyed it. I want to read this one so bad, I like how you broke everything down. I'm really glad you like this book. I wish I could have like it more. Nice review! This is a remarkable review for Daughter of Smoke and Bone. I am so glad that you liked it. It is one of my favorites for the year.